While Inbound 2013 officially kicks off this morning here in Boston, the Hubspot Partner Agency Keynote got the party started a little early last night. It was an awesome chance to network with other agencies from all over the world who are leading the charge to grow the inbound marketing mindset. Patrick Shea (@mpartickshea), Brian Halligan (@bhalligan), Pete Caputa (@pc4media), and Arjun Moorthy (@juicemoorthy) rocked the house! In just its fourth year, the Hubspot VAR program for agencies has grown to account for close to 40% of Hubspot’s overall sales. On top of that, companies that purchase Hubspot and partner with an inbound marketing agency have a higher renewal rate. This stat makes a lot of sense. Inbound marketing brings together a whole lot of moving parts; blogging, social media, SEO, email marketing, lead scoring, progressive profiling, etc. To complicate matters even more, the landscape is always changing. CEOs and marketing directors already have full plates. Often, it isn’t feasible to drop everything to learn the ins and outs of inbound marketing. Partnering with an agency can be a smart way to increase marketing capacity and ultimately showcase a greater ROI from your Hubspot investment. 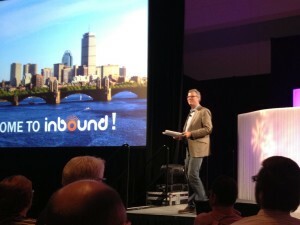 Traditionally, Hubspot has used two channels to market their all-in-one marketing software: direct and partner. This separation has caused a few headaches in the past. With the two separate channels, there would be confusion between the Hubspot sales team and an agency sales team if the same company was in both funnels. After seeing the success that the partner program has been able to produce, Hubspot has decided to do away with this two channel approach and start blending the two channels into one unified front. This is a win-win-win for Hubspot, Hubspot customers, and partner agencies. This transition is undoubtedly going to take a good deal of time and effort, but they have seen good results from the beta tests with several agencies over the past few months. Another big improvement that rolled out this year is a refreshment of the Hubspot certification programs. There are now three different levels of certification, Hubspot Certified, Inbound Certified, and Partner Certified. Each of these three areas of study require a different level of skill and understanding. This split, paired with the tiered ranking for agencies, will help agencies showcase their mastery of the inbound marketing methodology and help companies find the best inbound marketing agency partner. There is more awesome lined up today as the conference gets up and rolling. Keep watching the #Inbound13 hashtag for the latest updates!